Developer Matt Akins published a scathing piece yesterday that accused a company of stealing his video game. I’ve spent the last day looking into his claims, and the truth is...well, what’s your definition of truth? Let’s go down the rabbit hole together. Akins looked at how much money was being made on the mobile market by simple games like Flappy Bird, and decided he wanted in on the action, too. He spent a year experimenting with “simple, fun, crappy” games before settling on one that took the basics of Pong—hitting a ball between two paddles—and moved the playing field to a circle. He called it Rotable. Hundreds of games are published on the App Store every day, so standing out is difficult. Some games become popular through sheer virality, while others rely on old school advertising and marketing. Akins decided to look for a publisher and increase the chances of Rotable being a hit. Akins set his eyes on Ketchapp, a company focused on simple games usually involving one tap. Ketchapp was at the center of the Threes cloning controversy last year. Threes, a simple but devilishly addictive puzzler in which you stack numbers on top of one another, was quickly cloned. That’s not new—the mobile world is full of clones. Threes cost money, the clones did not. The most popular clone, 2048, made Threes playable in a browser. The developer, a fan of Threes, didn’t charge money, and made the code open source, meaning anyone could use it. Ketchapp took it and published 2048 with ads. It was huge, one of the biggest games in 2014. Many of Ketchapp’s games are, unsurprisingly, variations on other mobile phenomenons. 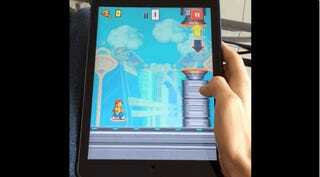 Hoverboard Rider, for example, is a reskinned version of Flappy Bird. Boring? Yes. Fair game? Definitely. On Ketchapp’s website, developers can submit their games for publishing consideration. Akins submitted Rotable to Ketchapp and crossed his fingers. The seven days promised on the website went by, and he didn’t hear back. He sent follow-up emails, asked around on Twitter, and tracked the studio’s founders on Facebook, looking for feedback. Eventually, they got back, but the news wasn’t good. Ketchapp was not interested in picking up Rotable and publishing it. He moved on with his life, but while sitting in his car and browsing the top charts, Akins noticed a game called Circle Pong! that looked eerily familiar to Rotable. Akins became convinced Ketchapp had looked at his game, told him they didn’t want it, built their own game around the concept, and published it through a shell company named App Cow. App Cow, like Ketchapp, publishes simple, one touch games on various mobile storefronts. Akins draws a connection between App Cow and Ketchapp with a few pieces of evidence. 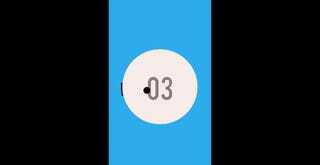 One, the game over sound effect in App Cow’s Circle Drop! and a Ketchapp game called Don’t Touch The Spikes are the same. I’ve downloaded both games, and can verify this is true. Three, App Cow is publishing several Ketchapp games on Amazon’s own app storefront. There are some other details to consider, however. And here’s another one, called Circular Pong, from 2012. Hassani told me Circle Pong itself was a clone of another game called Pongo Pongo. Pongo Pongo was launched on the App Store in June 2014, long before Rotable and Ketchapp crossed paths. Here’s how the three games—Pongo Pongo, Rotable, Circle Pong!—look next to one another. Knowing all this, here’s the timeline, as we know it so far. 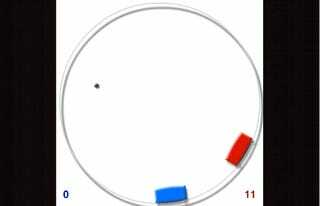 Circle-based Pong concepts have existed for a long time. None of the games featured in this story are doing anything particularly original. Pongo Pongo was published in June. Then, Circle Pong! quickly cloned it. Rotable, the game supposedly stolen, was submitted to Ketchapp in October, while Circle Pong! was transferred to a new owner in November. The same month, Ketchapp turned down Rotable. In December, Circle Pong! became popular on the App Store. Is your head dizzy yet? Hassani wouldn’t reveal his buyer, which might lead one to suspect that App Cow and Ketchapp are somehow connected. Ketchapp has made a living off cloning games like Threes and Angry Birds, so it’s not exactly out of the question that they might operate under more than one shell name. But Ketchapp denies any connection to App Cow: in fact, Ketchapp says App Cow is cloning their games. That’s right. The company best known for cloning is having trouble with their own clones. While the design and execution is basically the same, the color scheme and car models are subtly different. Brown instead of blue, yellow instead of red, hard corners instead of rounded. Would Ketchapp, a company known for spitting out games at such a rapid pace, really go through that much trouble to create a shell company cloning its games with subtle differences? Akins, the Rotable developer who maintains he’s a victim of theft, stands by his story. “There is no way two people could independently arrive at the exact same layout and design even if [the] concept is unoriginal,” he said. Ketchapp confirmed their conversations with Akins to me, but denied any wrongdoing. When I asked if Morcos could understand people’s skepticism, given the way his company lifted 2048 from open source code and handsomely profited from it, he stopped answering my emails. We know the concept for Rotable was not new. We know it was submitted to Ketchapp. Everything else? 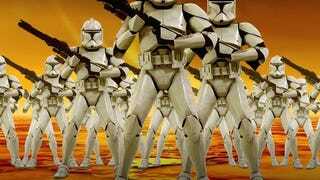 Merely a trail of clones, clones of clones, and clones of clones of clones. Notably, Akins did not ask Ketchapp to sign a non disclosure agreement when he submitted his game. Without one, there was nothing legally stopping Ketchapp from lifting the concept if they wanted to. Even that, however, is not a silver bullet. The larger problem is Akins is one person with limited resources. Akins has explored his options with a lawyer, but has decided to not move forward. Apple does offer a process to work on taking down games that infringe in various ways. The long and short of it: the world of mobile gaming is a total mess.